It's not uncommon to be offered a credit card when shopping at department stores and other retailers. The pitch usually involves a 15% or 20% discount off that day's purchase when you sign up for a store-branded credit card. But are those sign-up discounts worth it? The fact is that you should never sign up for a credit card or any other financial product on the spot without having a chance to review all the terms and conditions. The clerk who rings up your purchase and tries to entice you to sign up for a card probably has no idea what the terms are. At the least the salesperson should offer you a brochure that outlines the credit card terms. In general, store credit cards carry much higher rates of interest than non-retail cards. It's not uncommon to find credit card rates of 25% and higher. If you usually carry balances on credit cards, you're likely to end up paying many times the amount of that discount in interest payments. So think about whether that one-time discount is worth it. It's important to understand that not all retail credit cards are the same, and some may have very limited credit lines. Some can only be used at the retailer, while others are co-branded and may have a Visa, MasterCard, or Discover logo. Co-branded credit cards can be used wherever those cards are accepted. Credit card companies pull your credit report whenever you apply for a card. Think about that the next time you're tempted to take advantage of more than one of these discount offers when shopping at several stores. Having multiple credit inquiries in a short amount of time can lower your credit score. Credit inquiries stay on your credit report for 12 months. Retailers often offer credit card rewards and special promotions for cardholders. Those perks can include special discount days or free shipping. 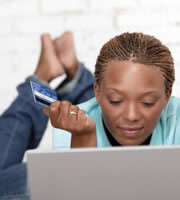 However, most of these credit card rewards programs are designed to get you to spend more money at the store. Some people have mastered the art of using store credit cards to get discounts on large purchases such as furniture or home improvements. However, for many people, any new credit line is an invitation go deeper into debt. So really think about whether it's worth it to sign up for credit card deals when you're out shopping. What's the deal? 0 Responses to "What You Should Know About Retail Credit Cards"